October is Energy Awareness Month: Conserve Water! It takes a considerable amount of energy to pump, heat, treat, and deliver the water that we use every day. On average, the annual energy used to deliver and treat water for only 10 households could power a refrigerator for more than two years. Heating water for showering, bathing, shaving, cooking, and cleaning also requires a considerable amount of energy. Homes with electric water heaters, for example, spend one-fourth of their total electric bills just to heat water. Being mindful of water use goes a long way in conservation. Simple things like taking shorter showers, or turning off the faucet when brushing your teeth or washing dishes, can save a lot of water. Another way to conserve is to install water efficient toilets, clothes washers, showerheads, and faucets. By replacing just one showerhead with a WaterSense labeled model, EPA estimates the average family can save 2,900 gallons of water, the amount of electricity needed to power its home for 13 days, and more than $70 in energy and water costs every year. The WaterSense label guides consumers in choosing the most water efficient appliances, much like the Energy Star label has guided consumers in making the most energy efficient choices. 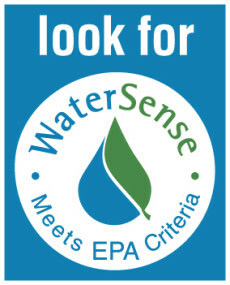 There are thousands of models of WaterSense labeled plumbing products to chose from and all WaterSense labeled products are tested and independently certified to ensure they meet EPA’s criteria for both efficiency and performance. For more information on WaterSense products, visit www.epa.gov/watersense. Showering is also one of the leading ways Americans use water in the home, accounting for nearly 17 percent of indoor water use.